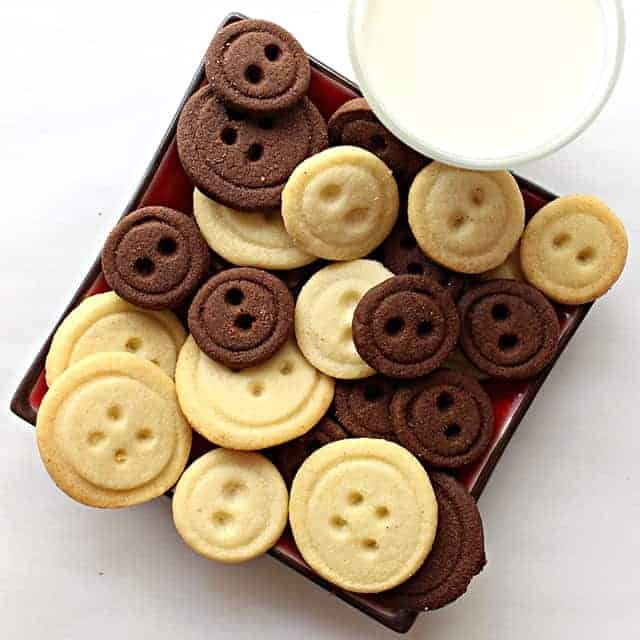 Vanilla and Chocolate Shortbread Button Cookies are as tasty as they are adorable! These bite sized cookies have a buttery crunch that melts in your mouth and are ideal for snacking or adding on top of a favorite dessert. Shortbread is a crisp, buttery, type of cookie that originated in Scotland. The main ingredient list is short and simple; butter, flour, and sugar. Some shortbread recipes supplement the flour with corn starch which adds a melt-in-your-mouth texture. Flavorings, like vanilla or cocoa, can be also be added. Vanilla and Chocolate Shortbread Button Cookies are a great choice when you want to bake ahead or for mailing. The flavor of these cookies gets even better after a few days. Stored in an airtight container at room temperature, shortbread cookies stay fresh for at least 2 weeks! Versatile shortbread dough can be baked in many forms. Though no special pans are required, there are decorative shortbread pans that create wedges or bars embossed with lovely designs. The dough can also be baked in a regular square or rectangular baking pan, then cut into bars. Rolling the dough into a log for slice-and-bake cookies, allows you to store shortbread dough in the fridge and quickly bake fresh cookies as needed! Individual cookies can be portioned with a scoop or rolled into balls. For Vanilla and Chocolate Shortbread Button Cookies, the dough is rolled out and cut into shapes. 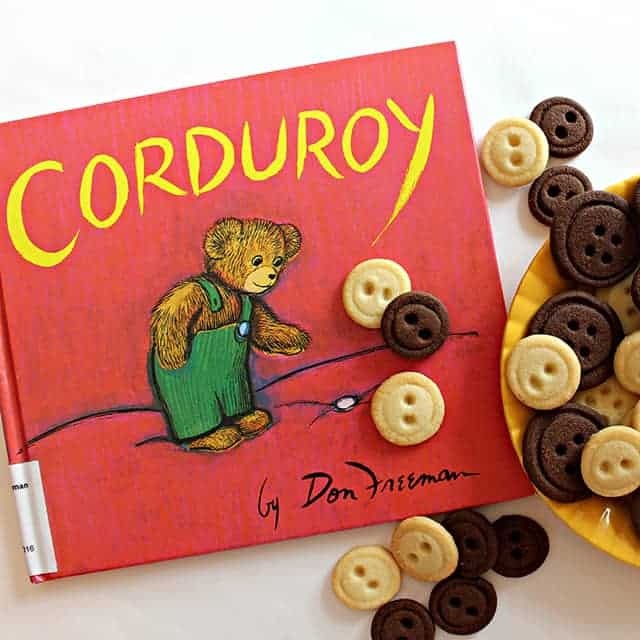 This month’s featured book, “Corduroy” by Don Freeman, is a childhood classic that is amazingly as popular today as when it was first published fifty years ago! 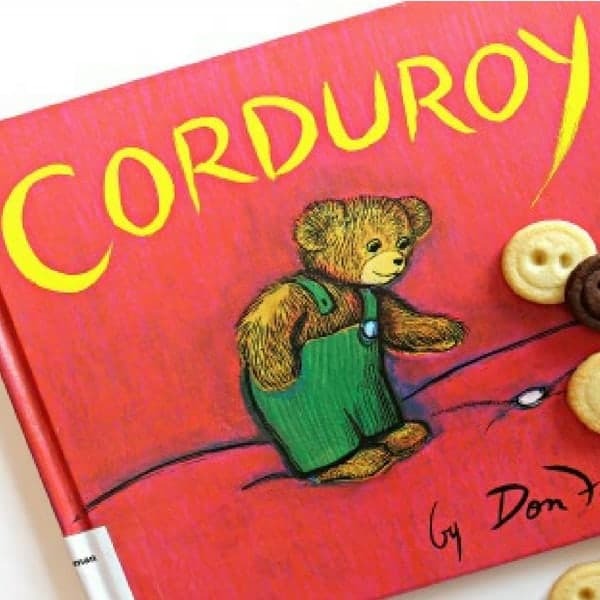 The original Corduroy book (there are also sequels and adaptations) tells the story of Corduroy, a stuffed toy bear, and Lisa, a little girl who loves him enough to spend all the money in her piggy bank to buy him. At first, is seems that Corduroy is destined to remain on the store shelf. His overalls are missing a button and Lisa’s mother doesn’t want to spend money on a damaged toy. At night, when the department store is empty, Corduroy has an adventure as he tries to find a replacement button without success. Luckily, the next day Lisa returns and uses all of her piggy bank savings to buy Corduroy and bring him home, where she sews a new button on his overalls. Vanilla and Chocolate Shortbread Button Cookies are the obvious cookie to link with this story! 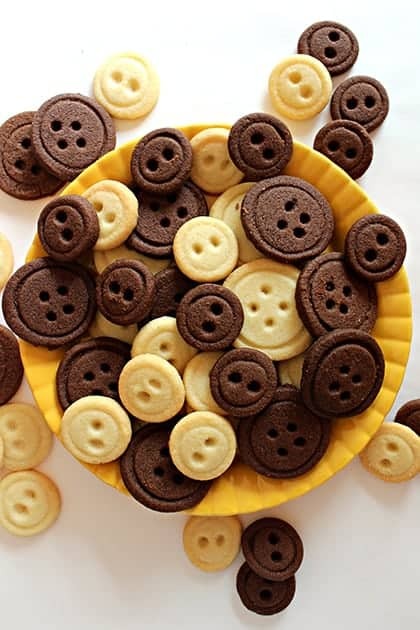 Make the cookies in several different shapes and sizes and let the kids decide which button Corduroy might have liked best. To make the Vanilla and Chocolate Shortbread Button Cookies roll the dough out to ¼” thickness between two sheets of parchment or wax paper. Use the small “cutters” to cut out the buttons. Gently press a slightly smaller shape into the center of the cookie to create a rim on the button. Make 2 or 4 thread holes at in the middle of each button using the blunt end of a wooden skewer. Chilling the cutout cookies for 1 hour to overnight firms the dough so that the cookies will hold their shape in the oven. 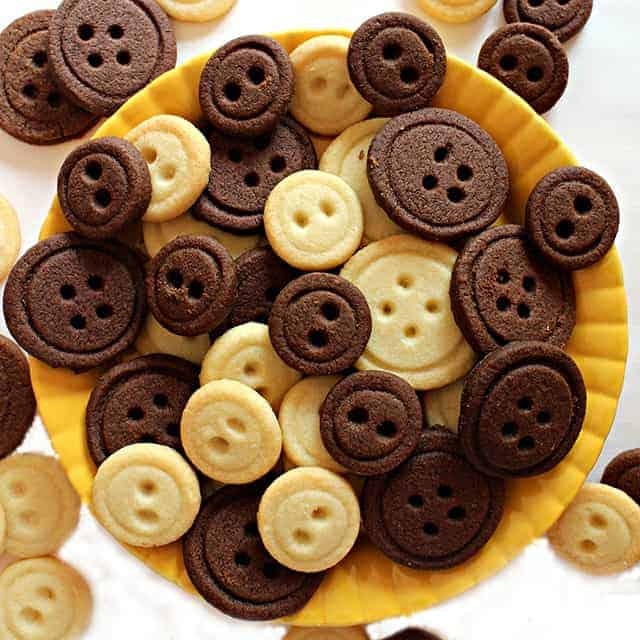 Sharing “Corduroy” and Vanilla and Chocolate Shortbread Button Cookies is sure to cause lots of smiles! In a large mixing bowl, stir butter, sugar, and vanilla until combined. Add the flour and corn starch. Stir until dough forms. Knead a few times in the bowl until smooth. For ½ batch chocolate dough: Divide the dough in half. Set one half aside and place the remaining half back in the mixing bowl. Add cocoa and mix with a wooden spoon until the cocoa is incorporated evenly to form the chocolate dough. Between two sheets of parchment paper, roll out each dough flavor to ¼”. If the dough is sticky, dust the dough lightly with flour (top and bottom) to prevent sticking. 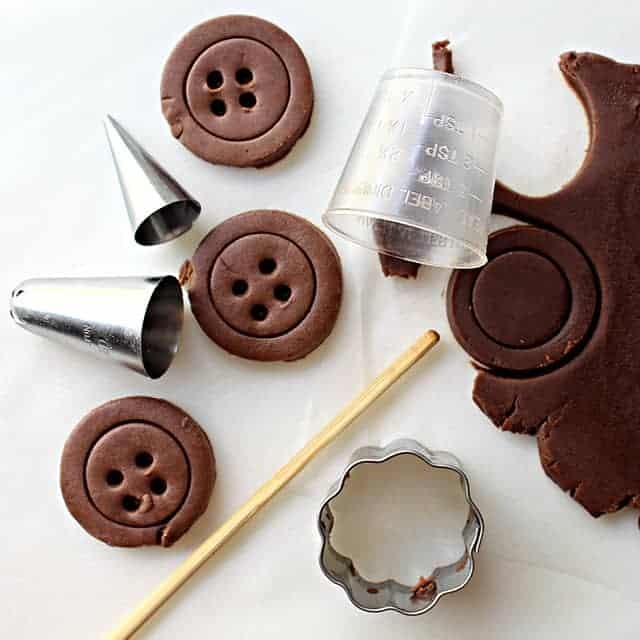 Use a small circle cookie cutter to cut out each button. Use a smaller circle to impress a center ring on the button. Use a skewer to place 2 or 4 threading holes at the center of each cookie button. Place the cut out cookies on the prepared baking sheet about an inch apart. Refrigerate the cookies for at least an hour (up to 24 hours), until firm. When ready to bake, preheat the oven to 375° F.
Remove the cookies from the refrigerator and bake for about 10 minutes, until the edges of the cookies are beginning to become golden brown. Allow the shortbread to cool on the baking sheet for about 5 minutes before transferring to a wire cooling rack to cool completely. Double wrap small piles of button cookies in plastic wrap. Then place bundles snugly in an airtight container or zip lock bag for mailing. In a large mixing bowl, stir butter, sugar and vanilla until combined.